I have absolute faith in Hannibal, which is the opposite of what I was saying a year ago when they began releasing material for it's first season. 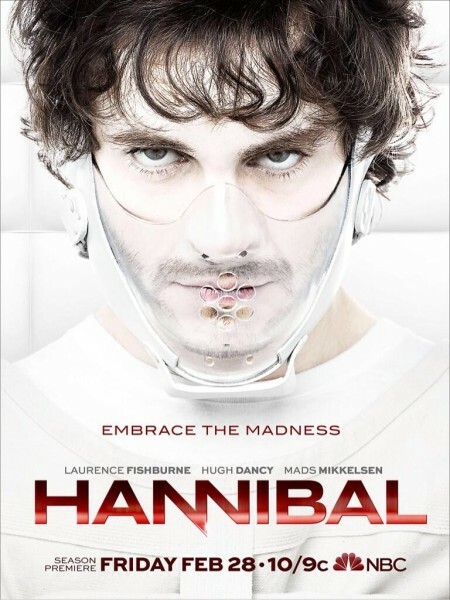 I was hesitant for yet another reboot to a franchise, and for yet another return to the world of Hannibal Lecter, but the series turned out to be one of the most interesting, the most disturbing and easily the best drama on network television of 2013. So, with this first look at season 2 (which is a mixture of footage from last year's finale and this year's premiere), I have absolute faith in Hannibal. I don't have faith in NBC. Last year, the May air dates served the series well, because it essentially meant it had the entire timeslot to itself. The other network's shows had wrapped for the season, and all that Hannibal aired against on Thursday nights was reality shows and the news. A February release for season two (which I will be reviewing) means it'll be in direct competition with other first run shows, which means the standards for ratings (and NBC is still strictly adhering to the outdated Nielsen numbers) will be higher. Secondly, the Friday night timeslot will not do it any favours. True, NBC is content with the performances of both Grimm and Dracula (which, content wise are a little closer to Hannibal than Thursday night comedies), but Friday is still regarded as the place you put things that you don't want people to see. My worry is that NBC is either trying to hide or sabotage the series, despite it being the best thing they've got going for them, and despite the fact that it is a cable-level show that managed to make it on network. Hit the jump for the season two poster, which is nicely complimentary to the season one image.